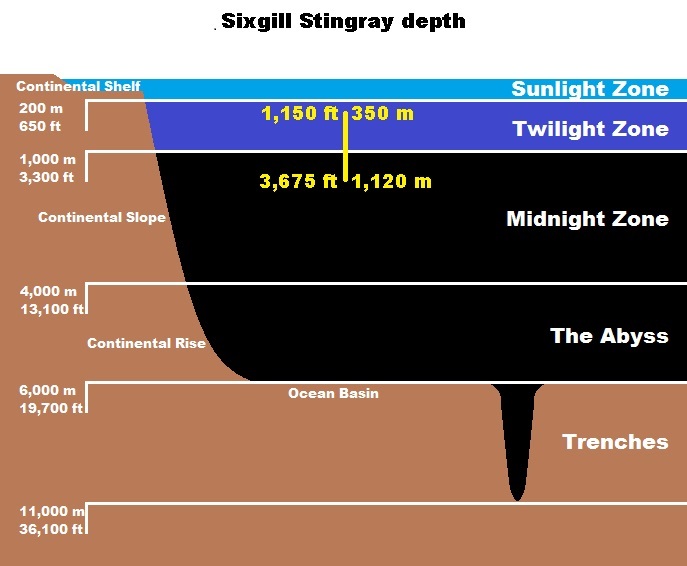 Sixgill Stingrays are bizarre. And it's not just because of the gills... although it is odd that, reminiscent of the six and seven-gilled Cow Sharks, they have six pairs of gills when all other stingrays have five. Nice start. Need more weird. 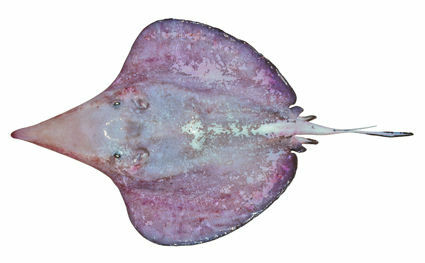 Sixgill Stingrays have been discovered in various scattered locations, off the coasts of places like Australia, Indonesia, Japan, India, South Africa and Hawaii, usually at depths between 350 and 1,120 metres (1,150 to 3,675 ft). It's thought all these sightings represent a single species, which would make it the only, lonely member of the genus Hexatrygon and the family Hexatrygonidae. 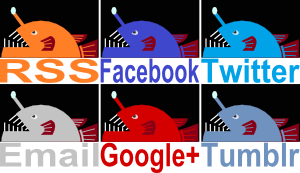 It would take DNA analysis to be sure, but if there really is just one species of Sixgill, then it's remarkably variable in terms of certain measurements. Measurements such as the proportionate length of its weird snout and the number of teeth in its weird mouth. Did I mention the weird snout and the weird mouth? Sixgill Stingrays have snouts that are long, flexible and full of receptors sensitive to the electric fields given off by living creatures. 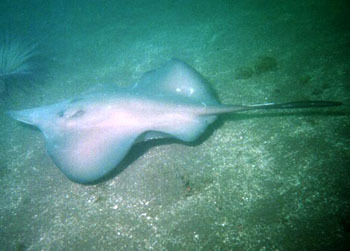 The stingray probably uses it to nose through soft, sandy sediment in search of buried prey. Then the hosepipe mouth can set to work. It's long, flexible and full of up to 100 rows of small, blunt teeth. They can give you a kiss from a surprisingly long distance away. 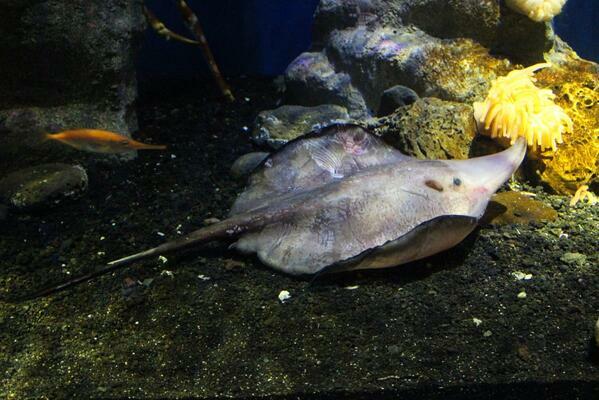 Sixgill Stingrays are quite big, with some females reaching over 1.5 metres (5 ft) long, males a little smaller. However, in keeping with so many other denizens of the deep, they have soft, fragile skin and weak jaws that probably can't deal with anything that has a shell. Still, with the flabby flesh, the mighty schnoz and the uniquely obnoxious mouth, it seems the Goblin Shark finally has someone to talk to at deep sea cocktail parties. okay, the mouth is creepy! Just try not to imagine it pointing the other way! 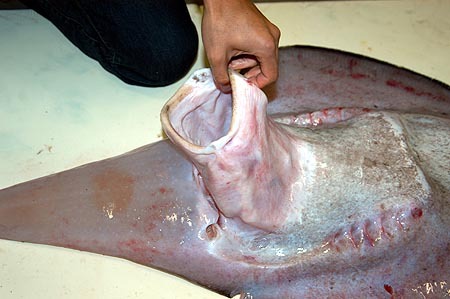 These guys have these amazing suckers for mouths and yet scientists named them after the number of gills they have??? @TexWisGirl: I know! Those gaping chops! @Esther: I know! What's up with these priorities?